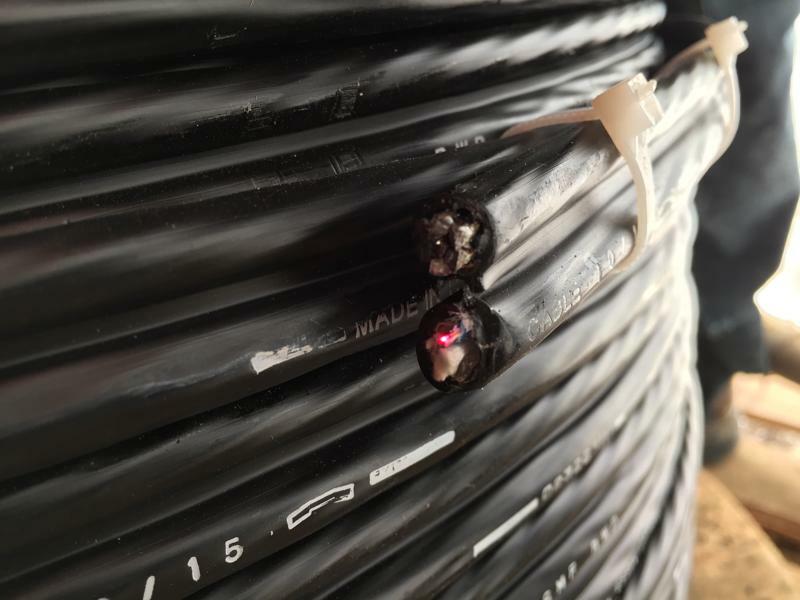 The FOA recommends that all fiber be tested before installation, after installation and after termination to ensure that it wasn’t damaged during any one phase of handling. I have to pretest all of the spools of fiber optic cable that arrive on the worksite? I didn’t budget time and money to spend on installing connectors that will have to be cut off! That’s a lot of wastage! I don’t know if I want to do that. Did the cable get damaged during transport? The intention of pre-installation testing of fiber is to confirm to all interested parties that the fiber cable did not suffer damage during transport and that it is functioning as well as it was when it left the factory. How should the fiber be tested? The practical question of pretesting fiber is this: “How should the fiber be tested?” Most people would agree that “Seeing is Believing” therefore an OTDR test would bring them the most peace of mind. Yet, there are alternatives to an OTDR when it is unavailable. Inject visible light into each strand of the cable using a Visual Fault Locator (VFL) and verify the light exits the far end of the cable. The technician should pay attention to the intensity of the light at the far end. It should be equal across all strands tested. When the intensity is weaker on one or more strands then damage is suspected and a visual inspection of the cable for damage is recommended. The VFL Method requires connectors on one end only. Inject calibrated light into each strand of the cable using a Light Source and verify the light power exiting the far end of the cable using a Power Meter. The technician should pay attention to the power level across all strands tested. It should be the same or similar. The connectors will introduce minute amounts of loss that can be ignored when they are at or below the expected mated pair loss value for the connectors that were installed. Refer to the connector datasheet for mated pair loss specification. The LS&PM Method requires connectors on both ends. Inject light into each strand of the cable using an Optical Time Domain Reflectometer (OTDR) plus its Launch Box and inspect the resultant imagery. The technician should pay attention to the length and to any events that occur along the fiber span. The lengths of each fiber tested should be the same length. There should be no events (connectors, splices or bending losses) except the mated connector pair between the Launch Box and the Fiber under test and the End of Fiber event. The OTDR Method requires connectors on one end only. The OTDR test is the commonly preferred test since it provides a visual representation of the fitness of the fiber. Again, “Seeing is Believing”. Since an OTDR is not always available, the best method is the one that can be performed with the available tools. In the hands of a trained professional (CFOT), each method is perfectly acceptable. If you want to learn more then consider taking the CFOT class. If you have more questions then feel free to ask me questions.